A serious stab at a strange concept, the JBL Soundgear puts a bubble of sound around your head. Pity it breaks up a little at higher volumes. The JBL Soundgear is a Bluetooth speaker you wear around your neck. Or, at a stretch, it’s a pair of headphones with open-air sound. This isn’t the first of its kind. The Bose SoundWear was unveiled last year and we tried a few LG Tone Studio pairs in 2017. But the JBL Soundgear is a more serious affair than the LG Tone Studio, with fairly meaty sound. You can even use it as a standard Bluetooth speaker if you like. However, you’ll get better sound quality from cheaper headphones, and the Soundgear has a significant issue with bass distortion at high volume. It’s not that easy to make something more silly-looking than a pair of Apple AirPods. But JBL has done it. JBL Soundgear looks like a toilet seat, or the world's most pathetic airline pillow, when it’s around your neck. This isn’t JBL’s fault either. All neck speakers look slightly ridiculous, and this one is more stylish than the models LG released last year. The Soundgear is a smooth, moody-looking horseshoe of a speaker. There’s speaker grille-style fabric on its top, soft touch plastic underneath. You feel its 349g weight when you first put the thing around your neck, but other aspects are actually more noticeable. Most of the Soundgear is rigid. Only a small part of the back is flexible, letting you open up the front gap a little to fit the set around your neck. The JBL Soundgear does feel a little like a piece of apparatus, not an entirely natural fit. But you get used to it. Bass rumble is the other potential sensory problem. While the bass drivers are at the back, avoiding the sensitive area by your collar bone, bass music played at 60-plus per cent volume does cause some noticeable vibration throughout the Soundgear. The JBL Soundgear is not flat-out uncomfortable. It could be, and look, far worse. But its feel is nothing like the neck pillow it kinda resembles. Despite some rudimentary sci-fi overtones to the whole concept of a neck speaker, there’s nothing too complicated going on in the JBL Soundgear. It’s a Bluetooth speaker, and functions like one. You pair it in the usual manner, there’s no NFC, and it takes all audio from your phone. Including notifications, which can make you jump out of your seat if you accidentally leave the volume up too high. There are basic volume and playback controls on one of the JBL Soundgear’s arms, and they are clicky buttons with decent tactile feedback. Battery life seems unremarkable at six hours, with two-hour charging. However, thinking about how we’d actually use the Soundgear, this seems perfectly fine. Use a Soundgear on a commute or a plane and you’re doing it wrong. That is plain antisocial. It excels when worn as you walk around your house, listening to podcasts, the radio or some music. Or as a VR speaker. While the Soundgear must have drivers tuned for near field use, there’s no magic technology to keep your music for your ears but no-one else’s. Such “narrow dispersal” speakers do exist, but you’re more likely to find them in a museum or art exhibition than an electronics shop. Crank up the JBL Soundgear’s volume to max and you can take it off to make a decent Bluetooth speaker, perhaps to play some tunes while you shower. Don’t wear it in the shower, though. It’s not water resistant. The JBL Soundgear uses four drivers. Two mimic the position of headphone drivers, sitting below each of your ears. These take care of the mid and higher frequencies. Two additional 31mm drivers, this time with bass-enhancing ports, sit further back. This quad driver array gives the Soundgear great stereo imaging. It’s the sound’s strongest suit. The experience is not like listening to a hi-fi with floor stander speakers. It’s closer to a sort-of space helmet of sound, with audio seeming to come from behind and in front of you, like a sound bubble with a radius of about 30cm from your head. After using the LG Tone Studio and not being all that impressed, the immersive nature of the Soundgear’s soundstage is quite fun to experience. To start with it takes you out of your environment as you try to pinpoint the positioning of various sound elements, even if you’re just listening to a podcast. There’s a 3D element to the Soundgear’s presentation that is neat. The tonal aspects of the Soundgear’s sound are somewhat less impressive, though. At lower-mid volumes it’s a pleasant listen. There’s a decent amount of bass, fair balance and solid treble detail without obvious sharpness or harshness. Increase the volume and the cracks start to appear, though. And the Soundgear only really starts to produce sound at 70Hz, cutting out all sub-bass and very low bass frequencies. However, there’s still clear bass distortion at higher volumes when there’s a healthy amount of low-end in the mix. The double bass intro to Kamasi Washington’s Askim set this off, for example. The drivers try to recreate frequencies they can’t really handle, and it exhibits as a sort of clicking or buzzing. Putting the Soundgear through a tone generator to see how bad the problem is, this distortion is audible from 70Hz right up to 145Hz, well into the standard bass register. Granted, this problem tends to surface at volumes we probably wouldn’t use day-to-day. And not just because we like to take care of our ears. You see, the Soundgear sound also becomes a little harder-edged at high volumes, the mids becoming a little abrasive to the ear. This “shouty” tone isn’t there when you set the Soundgear down on a table. Engineers may have nailed headphones drivers and speaker drivers, but this in-between place where the drivers are a few inches from your ears is something else. The JBL Soundgear don’t quite get you the hi-fi experience you may expect at the price. However, its soundstage presentation is quite different from traditional speakers or headphones. And it’s worth experiencing if, for whatever reason, normal headphones and Bluetooth speakers just don’t fit the bill. The JBL Soundgear doesn’t offer killer style or sonic perfection, but this feels like a more serious effort at a neckband speaker than LG’s attempts from 2017. Sound is decent at low and mid volumes, and the soundstage presentation is particularly enjoyable. However, there are real problems with bass distortion and Soundgear just isn’t pleasant enough a listen in general at high volumes, considering the price. 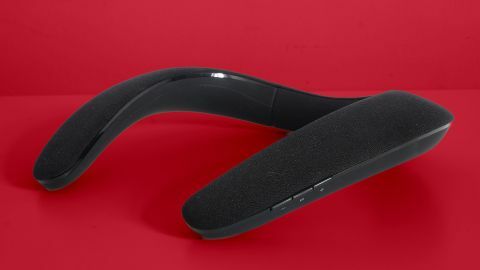 The neck speaker may also be a solution to a non-existent problem, given its leaky drivers aren’t really a “personal” audio experience as such.